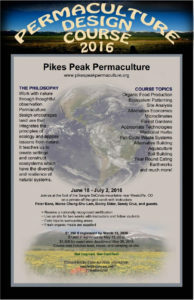 This two-week PDC hosted by Pikes Peak Permaculture with instruction by Peter Bane, Marco Chung-Shu Lam, Becky Elder and Sandy Cruz is taking place June 18-July 2, 2016, at the foot of the Sangre De Cristo Mountains near Westcliffe, CO, on a private off-grid ranch. Members of the Pikes Peak Permaculture Guild and other previously certified permies may audit this course at no cost on days 4-11. Auditors need to bring their own food. For more information, email Steve or call seven one nine six eight five zero two nine zero.